The success story continues for the Hodgdon Yachts' custom tender division with the delivery of the fifth and sixth hulls. This pair of 8.5m tenders, built in infused epoxy carbon fibre, were designed by Andrew Winch. The limousine tender features a beautiful curved teak clad transom, retractable glass, lifting roof and accommodates eight guests in a luxury interior executed in teak and leather. 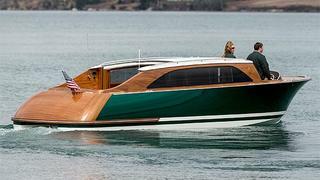 The open tender has seating for 12 with a retractable hardtop over the helm station and a retractable bow ramp. Both tenders are currently being shipped to The Netherlands where they will join their soon-to-be-launched mother ship.